OST to MBOX converter tool provides the remarkable features to export OST file to MBOX. It gives an admirable means to the user to convert Outlook emails to MBOX and make them accessible. Using this tool, the users can also convert multiple Outlook emails & attachments to MBOX format. Any kind of corrupted or damaged OST file can also be scanned quickly to fetch data from it. When you open the OST file for conversion, it scans the complete OST file and extracts the emails from the inaccessible or damaged OST file. Moreover, there is no limitation on the file size to convert OST to MBOX as it converts any size OST file into MBOX file format. Additionally, it doesn't require any Exchange Server environment for carrying out OST file migration. This software tends to export OST file to MBOX for MS Outlook 2013 and all below versions; without any data loss. 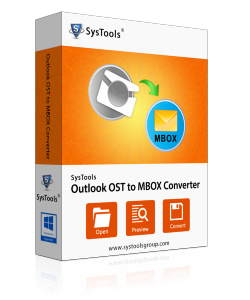 It gives the solution to convert several Outlook emails to MBOX from the OST folder. Thus, providing a way to convert Outlook emails including inbox, outbox, drafts and sent items etc to MBOX format. While the scanning process completes, it creates an immediate preview of all the items of the OST file including inbox, outbox, contacts, calendars, notes, tasks etc. So, the user can view all details from the selected OST file within interface. The software acts as a meaningful medium to convert the OST file into MBOX format, which can be directly imported to MBOX compatible applications such as Thunderbird, Eudora, Entourage etc. The OST to MBOX Converter software allows the users to export all the recovered items or folders from the OST file into MBOX file format. The users can easily choose to save the required data items or folders into MBOX file, which can be opened with multiple applications such as Thunderbird, Entourage, Eudora etc. If you want to access your OST file, which has been badly damaged or corrupted or looking for migration to MBOX applications, OST to MBOX Converter can prove to be the best choice. This software facilitates you to convert OST emails to MBOX through Quick scanning mode and quick recovery. It supports to provide efficient conversion solution for Windows 8 and all the below version. The trial version of this software enables the user to view all OST email. However, for the complete recovery of OST file you need to purchase the full versions from the official website.